MINDFULNESS is a popular subject these days. On one side it sounds very progressive and modern in these days when people are searching for ways to cope with everyday life in general. On the other it sounds very esoteric and mysterious something unique to Buddhism and those who claim enlightenment. 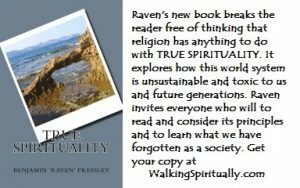 It is something that has certainly been capitalized on by many a spiritual guru out to make a dollar off the innocent and naïve. But it is really none of those things and isn’t that hard to understand and will make such a difference in our day to day lives if we understand it and incorporate it into our lives. Let me attempt to clear up the mystery. Mindfulness is living in the present moment. It is denying the past and future’s power over you. It is an awareness of the moment and walking in and enjoying the present moment. 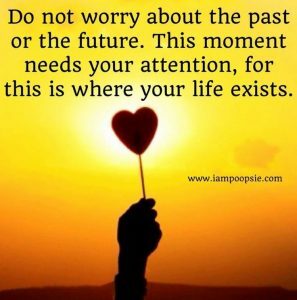 It is receiving the power and joy of the present moment you are in right now. Most of our worries and defeats come from looking back to the past or looking too far into the future. 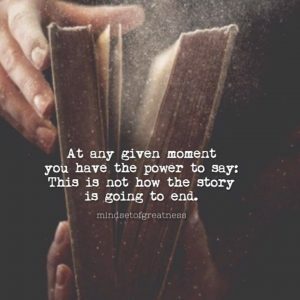 The only moment you truly have power over is right now, this present moment. The mind is a powerful thing but it sometimes has ‘a mind of its own’ and thinks it is in charge. It will run wild with imaginations and worries about things that will probably never happen. It won’t leave the past in the past. It constantly brings back bad memories and worries about how something in the past is going to pop up and cause a problem. We so often think we are at the mercy of our thoughts and that we cannot control what we think but it isn’t true. We do have control over what we think and how we process our thoughts, fears and worries. Once we realize this it will set us free on a level we never dreamed possible. It is not something that comes natural though. It has to be intentionally nurtured. We have to intentionally train and discipline our minds. Our actions are a direct result of our thoughts. Negative thoughts create a negative life. Worry, doubt, confusion, depression (most cases), anger, feelings of condemnation, all these are attacks on your mind. We must learn to gain control over our mind and find freedom and peace. Recognize damaging thoughts and stop them from influencing our life. Be patient with ourselves even when we make mistakes. Arm ourselves with positive thinking Follow the light out of your mental wilderness (bad attitudes and excuses people use that keep them from being free.) and find undreamed of happiness and fulfillment. I know that is promising a lot. And I don’t come to you as one who has mastered this. But if you knew me only 10 years ago and walked with me on my journey till today you would understand how far I have come. A book that really helped me was Battlefield of the Mind by Joyce Meyer. That book literally saved my life. There was a time in my life when I was so afraid. I was afraid that every ache and pain was something serious, I was afraid something was going to happen to my children, I was afraid I would lose my job or I would not have enough money to pay my bills…afraid, afraid, afraid. I was sad and depressed all the time. I didn’t want to live. It got to a point that I thought I was losing my mind and on the verge of a nervous breakdown. I couldn’t sleep. I was tormented by my thoughts. I thought I was at the mercy of my thoughts but this book helped me to realize that I controlled my thoughts and I could choose what I think. I learned a lot about dealing with worry and fear. 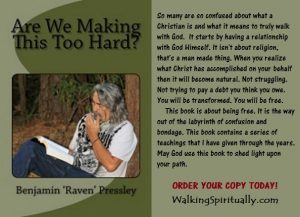 That book used the Bible and explained things in a way I had never thought of before. First of all realize you have not been given a spirit of fear, but of power and love and a sound mind (2 Timothy 1:7). Get this verse in your head and into your spirit. Say it out loud frequently. Every battle you fight in this life will be won or lost in the mind. Some things you cannot control but you can control how you think and how you are going to react and what you are going to do about it. Proverbs 23:7 says as a man thinks in his heart so is he. What do you think you are? If you think you are weak and fearful, you will be weak and fearful. 2 Corinthians10:5 says bring every thought captive. Control your thoughts! Where the mind goes the man follows. Get your mind on an ice cream sundae long enough you will go and get one. If you think someone has hurt you long enough you will not treat them right. We can do something about what we think about. We are not at the mercy of every thought that pops into our head. 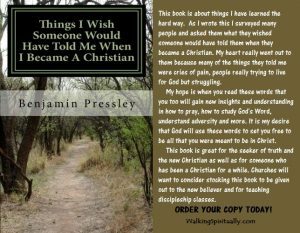 Did you know you can think thoughts on purpose? Sure you can. And it is important that you do just that! Take some time every day to have a think session and meditate on thoughts that build up, thoughts that edify. Surround yourself with positive thoughts written on sheets of paper taped here and there. Make a file of positive thoughts and quotes. 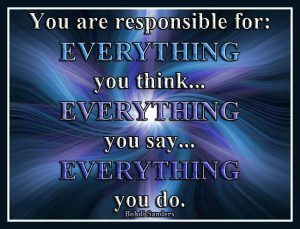 We have to take responsibility about what we think and how we look at ourselves and how we talk about ourselves. It is our responsibility. What you say about yourself affects you. The Bible says we are snared by the words of our mouth (Proverbs 6:2). It affects us. It affects our direction in life, our relationships, you name it. No matter how long you live you will have to confront ‘stinkin’ thinkin’’. Refuse to let your mind be the dumping ground of negative thoughts. Refuse to listen to, accept and believe what people say negative about you. It is only true if you believe it and give it that power over you. Colossians 3:2 says set your mind on things above. Setting your mind is one of most important things you can learn. Setting your mind means making up your mind ahead of time. For example you need to rehearse in your mind in advance what you are going to do when faced with temptation or fearful thinking. If you already have your mind made up what to do ahead of time then when it comes you will know exactly how to react. Athletes prepare ahead of time and train themselves. Lawyers prepare themselves ahead of time. Why shouldn’t regular people do the same? That way your emotions don’t drive you. You know what you are going to do ahead of time. Whatever it is. Talk to yourself ahead of time. Set your thoughts. Get the idea? You program your mind ahead of time. Then you will not be a slave to outside stimulus. This is what the Bible calls transforming and renewing your mind (Romans 12). Decide ahead of time what you will do and don’t just react when the circumstance comes. Renew your mind and keep it renewed. Like a car or house you have to keep it up. It is a continual process. Renew the entire mind Romans 12 says. Deal with every thought. Don’t condemn yourself just move forward. It takes a while. It took a while to get this way it may take a while to get free. I might not be where I need to be but I’m not where I was yesterday. It takes commitment. 1 Peter 1:13 says, “Gird up the loins of your mind”. What does this mean? In olden times they wore a robe and they would grab their skirt and pull it up and tuck it in their belt so they could run and nothing would hinder them or trip and make them fall. Maybe you have seen your granny do this to work in the fields. So gird up the loins of your mind is to get all the junk out of your way that hinders you, or that would trip you and make you fall. I have heard someone say that FEAR stands for False Evidence Appearing Real. Studies have been done that say 90% of what we worry about never happens. Fear and worry are like a big old magnifying glass that makes things look bigger than they actually are. It turns molehills into mountains. Break that magnifying glass! 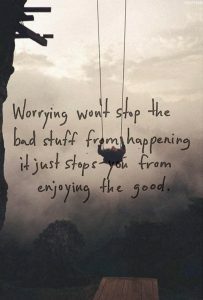 Worrying doesn’t help. It only makes things worse. There are usually only two things we worry about: things we can do something about and things we can’t do anything about. Well, if you can do something about a situation, then do it. If you can’t do anything about a situation then there is nothing you can do to change it. In either case it doesn’t make sense to worry. Worry and fear only stress you out and make things worse. Another thing that really helps is meditation. 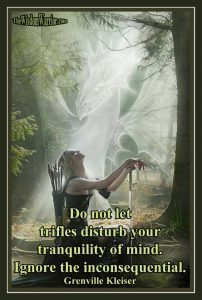 Take time daily to just get in a quiet place. Get comfortable. You don’t have to sit cross-legged in a lotus position, just find a comfortable place and position to sit in. Close your eyes. Clear your mind. Take three deep breaths. With each exhale imagine tension and stress leaving your body. Take at least 15 minutes to just sit there and breathe. 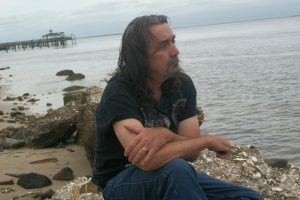 My friend Raven Cain, a Buddhist priest, musician and martial arts master suggests 24 minutes, one minute for each hour of the day. Focus on your breathing or a word like ‘peace’. When distracting thoughts come just acknowledge them long enough to send them on their way. Don’t let them linger. Be single-minded. 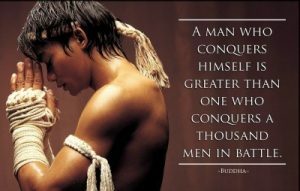 You are training and disciplining your mind to come under YOUR control and to not let every thought control you. The more you do this the more in control you will be. Breathing properly is important. There is plenty of scientific and experiential evidence to support the benefits of meditation. It benefits cardiovascular and immune health. Meditation definitely helps but the goal is to be able to incorporate these principles into everyday life. Meditation should be more than formal meditation. It should be a state of mind you can enter into when walking, playing, being with friends, laughing, doing art, singing, doodling, gardening…whatever. Getting outside, hiking and adventure can help us achieve this state of mind. You may even find Mindfulness boosts creative thinking. It can increase a heightened awareness and consciousness. When you learn to be mindful it will affect the way you think about lots of things. You may even find yourself exercising and eating healthier foods. You will have no problem getting toxic, draining people out of your life. You will have the confidence to reevaluate what is working and what is not working in your life. 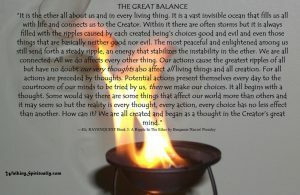 And like everything it is about balance. You don’t want to be excessively preoccupied with happiness. It is not about avoiding negative emotions and experiences but having a healthy attitude about them. You learn to cope and even coexist with life even when it takes a negative or challenging turn. It is more than looking on the bright side it is living on a steady even keel. You will begin to develop a balanced view of your own self-importance. Not obsessed with yourself and life being all about you. You can laugh at yourself and not take yourself so seriously. You can look in the mirror and not just see flaws but see a person you like. ENJOY THIS VIDEO OF ME SPEAKING ABOUT MINDFULNESS! . . . . .ALSO CHECK OUT MORE VIDEOS ON THAT SAME YOUTUBE CHANNEL! 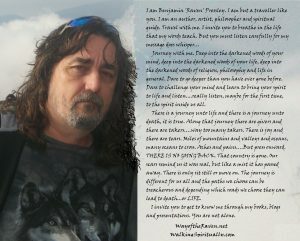 For positive thinking and being a warrior in life check out my WARRIOR SCOUT series! 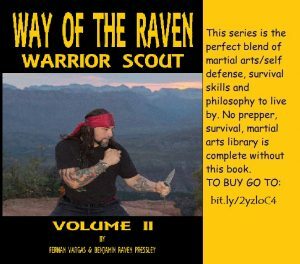 Self-Defense, Survival Skills, Warrior Philosophy. 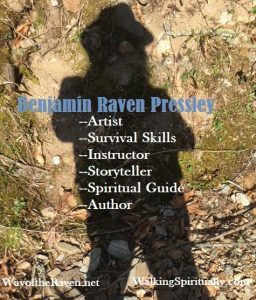 MANY BOOKS AVAILABLE BY BENJAMIN RAVEN PRESSLEY TO ASSIST YOU ON YOUR SPIRITUAL JOURNEY!